Years ago I sat down in a cinema to watch Mean Streets. I brought a woman who said she’d never seen it before, and I had that anxious feeling you get when you’ve told someone you have a particular fondness for a film, and they’ve agreed to jump in. Will it be too violent? Too macho? Too sad sack? Too melodramatic? In a sense, you are staking your character on its quality. Minutes into the titles she leaned over and said, “Wait, this is the one about the woman with epilepsy, right?” Right! I’d never have described it that way, but that’s how Mean Streets resonated for her. Watching some “new classics” all over again this month, it strikes me how different stories can be in our memories. In mine they’re apparently much more spare and concise than the actual films were. Co-writer Jean-Pierre Bacri (right) kills it as the nouveau riche just starting to develop a sense of taste. 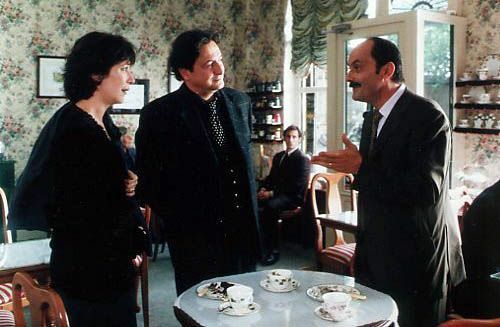 For one, I saw the 2000 French drama The Taste of Others (script by Agnes Jaoui and Jean-Pierre Bacri) again. To me, it’s about a wealthy industrialist who gets a crush on his English tutor, an actress, which inspires an aesthetic awakening in him. It starts with the deliciously crass company owner Castella knowing nothing about art, and the actress’ artsy friends making fun of him. Then Castella goes on a spending spree, which causes a rift between the actress and her friends. Well, what a surprise to see so much screen time devoted to Castella’s bodyguards. They discuss love and ethics and, of course, soccer. One of them, a former cop, falls for the hash-dealing barmaid at the restaurant the artists frequent. Meanwhile, Castella’s also trying to bankroll his wife’s floundering, and very tacky, interior design career. Someone else might have told you this is that sad film about the bodyguard-amateur flute player. Secondly, getting excited for Leviathan,* I watched The Return (script by Andrey Zvyagintsev) again. The 2003 Russian film about the father who takes his two sons on a camping trip by boat, with some sketchy intentions, was quite different in my memory. I thought it was a super-tight thriller about a boy endangered by his father. I was surprised it took so long for the father to arrive, and the three of them to get to the boat at all. In fact, it’s a lot more about character: The younger son who scarcely remembers his father resists his authority from the get-go, while the older son identifies with dad more. It is about a stubborn child, whose intuition about his dad turns out to be absolutely prophetic. As a rule we should mind this memory gap! It says lots about each of our own peculiar tastes. If a film moves us, we hold onto its memory, sure, but often as not we start ascribing qualities to it that we think great films ought to have: Because we like it, it therefore must have these things, because we like films that have these things. And reality doesn’t always cooperate, so we learn by going back and re-watching. I’d previously thought I was a “plot smith,” or something like that. I cared about the mechanics and harmony of plot, about everything feeling like it’s in the right place, but character was of secondary importance. I could learn to like anyone for an hour and forty-five minutes, I figured. Well, maybe so, but the things that make plots stick to my heart are the characters, not to mention the secondary characters who provided the contrast I may have needed to fully appreciate that main character. People fall for films with “just okay” scripts all the time – me probably less than most – but I may not be as impervious as I like to believe. *And speaking of Leviathan, it’s been written about a lot. Suffice it to say, any time someone starts billing a film as a definitive comment on a nation’s situation, he’s probably doing that film a disservice. Its trailer made it seem more like the thriller I mis-remembered The Return as, and in reality it was even further away. Now that films get watched at home instead of cinemas, and a theatrical release is essentially a publicity stunt that a film must go through to get reviewed by critics and talked about by people like us, it only makes sense that “serious cinema” season is getting shorter and shorter. Like baseball in the post-wild card era, a film just has to get hot at the end of the year, pick up some awards and live a successful life on streaming and cable. Not that it’s a completely bleak situation. While we’re waiting for this year’s crop of films that will jockey for the Oscar brand, the cinemas need to show something, so a little indie gem such as Blue Ruin, which had no big names and therefore wasn’t really going to be a contender anyway, can get a spring release without the established independent film names to crowd it out. Starting this month, however, it is fully on. Between now and the end of the year, there will be new films from P.T.Anderson, Mike Leigh (doing period again, no less), and Nuri Bilge Ceylan, the Turk who made Once Upon a Time in Anatolia, among others. More than any of these, though, I am looking forward to the new film from Andrey Zvyagintsev, Leviathan. Can’t wait!